TS Residential Recruitment TGT Hall tickets 2018:: The Telangana Residential Educational Institutions Recruitment Board, TREIRB released the Hall tickets /admit cards for the post of Trained Graduate Teacher, TGT recruitment examination on September 22, 2018 at 11 am. 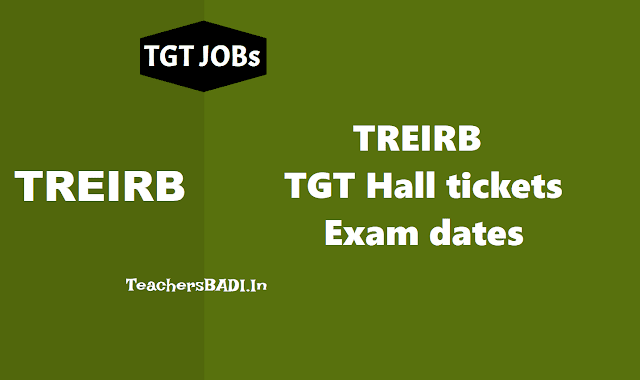 Candidates may checkthe TREIRB TGT Hall tickets /Admit cards 2018 on the official website, treirb.telangana.gov.in. TREIRB TGT exam would be conducted to recruit 960 Post Graduate Teacher and Trained Graduate Teacher across Telangana. The written exam would be followed by an interview. The exam would be held in two slots, one in the morning at 10 am to 12 pm and the second session would take place at 2 pm to 4 pm. Check the official notification of TREIRB exam schedule 2018. Check the link and steps to download TREIRB TGT Hall tickets /Admit Card 2018. Step 1: Candidates need to visit the official website of Telangana Residential Educational Institutions Recruitment Board, TREIRB. Step 2: Click on ‘Download TGT hall ticket’ on the top of the homepage. Step 3: Enter log in details like- mobile number and password. Step 4: Your TGT Hall tickets/ Admit card would be displayed on the screen. Date of examination, time, centre would be mentioned on the Hall tickets /admit card. For downloading the hall ticket for TGT and PGT post, Candidates are required to login. After login towards the left side, there is a link by name "Download Hall Tickets". From there you can download the Hall tickets of Paper-I, Paper-II & Paper-III. New Candidates are informed to download the Halltickets well in advance. Halltickets download would be stopped one day before the exam.